The conference was held at Winnipeg’s Cineplex Odeon VIP Theatre. This is the second time we’ve hosted our User Group at this venue, the large movie screens are excellent for presenting in front of a large audience. Thanks to the staff for providing great service. The day started with a brief history lesson on Dynamics GP and Prophet Business Group. We also covered what’s new in Dynamics GP 2018 R2 and Microsoft’s direction with Dynamics GP. After the opening session we utilized all three VIP theatres with concurrent sessions throughout the day. It was a busy day and we covered a lot of material, users were kept caffeinated and remained until the end of the day with the promise of a cocktail hour sponsored by Lenovo Canada. 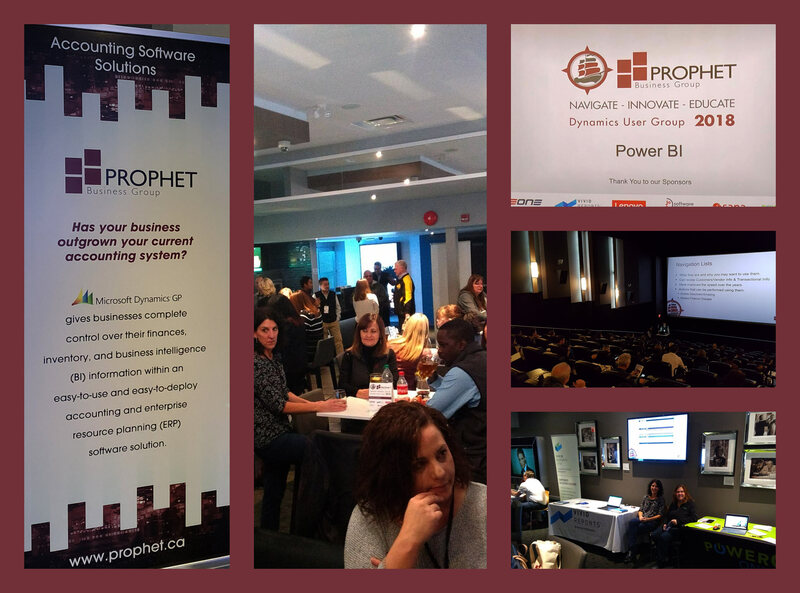 We had a number of other sponsors and presenters this year including eOne Solutions, Vivid Reports Business Intelligence, PowerGP Online, Sana Commerce, and Joesoftware Inc. The day ended with cocktails in the VIP lounge and prize draws for a couple large screen televisions. Congratulations to Daisy and Lise! We asked attendees to provide feedback throughout the day and we had mostly positive responses to the session material and to the conference. Thanks to all attendees who offered comments and suggestions. It’s great to get feedback so we can work on improvements every year. We read every comment carefully and will consider all suggestions in preparation for our next user group. If you were unable to attend, you may still access the material presented on our website and contact us with any recommendations for a future user group. A conference such as the Dynamics User Group takes a lot of planning and preparation to ensure attendees have a great overall experience. Planning for our 2019 user group is already underway. If you haven't already, sign up for our newsletter and stay informed on upcoming events and blog articles.